Yesterday was Kim and my 9th anniversary. It is a special day; we like to celebrate it with a romantic dinner while talking about the details of our first date. This year Kim left me a cute message on Senia Mae's chalkboard as well. It was covered with the letters KIM...KIM...KIM because these are three letters our little one has been working on at school. Underneath Senia Mae's writing Kim wrote 'LOVES KARA'. Senia Mae stared at the chalkboard all day. She thought it was so cool that is actually said KIM LOVES KARA and could not stop talking about it. That was the cutest thing I had ever seen until she took it up a notch today. As I was sitting at my computer desk she pulled out a little note pad and started writing. 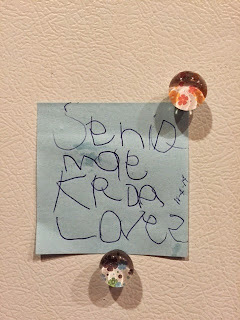 This is what it said: Senia Mae Kara Loves (supposed to be Senia Mae loves Kara, but we get the idea). She wanted me to know that she loves me, too! I felt my heart instantly seize up as I looked over at my daughter, wanting to keep her in this phase forever. L.O.V.E...there's no better words to describe it.